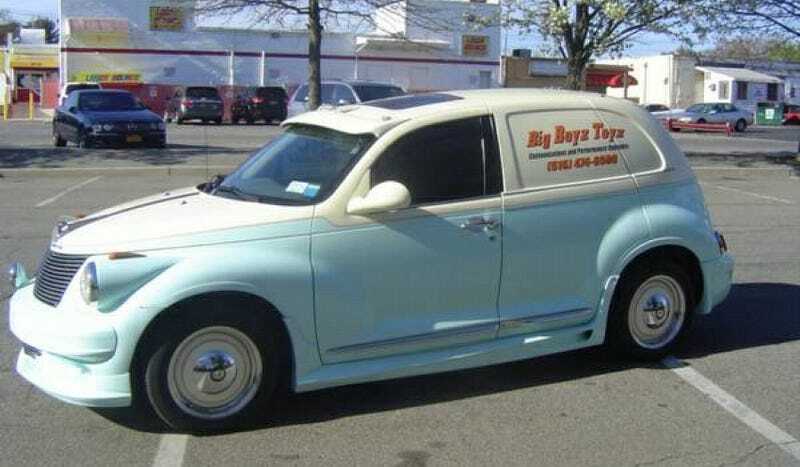 While unabashedly retro in factory form, for some Chrysler’s PT Cruiser just wasn’t old school enough. Today’s Nice Price or Crack Pipe custom PT incorporates even more Plymouth parts of yore, but is its price far too modern? When it was first introduced back in the ‘80s Ford’s used bar of soap aero-design trope - as exemplified by yesterday’s 1989 Merkur Scorpio - looked like something straight out of the future. That T9-equipped Euro Ford still looks pretty slippery today, and 76% of you felt its price was good enough to not let slip away. From the future to the past and then right back again. That’s both the plot line of the beloved trilogy staring Michael J Fox, and the idea behind many a retro ride. Today’s Chrysler PT Cruiser started out as just such a look back perched upon modern (well, Neon to be exact) mechanicals, but this one has been customized for use as an advertising tool to be even more steeped in nostalgia. The PT Cruiser was a bold move for Chrysler. Developed during an era where the brand was turning auto show one-offs into production models with regularity, the Neon based high-roof five door was presaged by the Pronto Cruizer concept, which debuted at the 1999 Geneva Auto Show. It was initially intended for the Plymouth brand and maintained a styling relationship with that brand’s retro auto show to production car, the Prowler. Unfortunately for Plymouth, Daimler bought the company, and brought in the Bobs who couldn’t figure out just what it was that Plymouth did around here. But, but. . . I have people skills! As a result of Plymouth getting the sack, the PT went to Chrysler, where it vied uncomfortably in dealer showrooms with 300Ms, Town and Countrys and Sebrings. Based on the cost-is-every-object Neon, the PT Cruiser’s driving dynamic was much like the coarse little Dodge/Plymouth, only tippier owning to its higher center of gravity which in fact was about three stories up. Of course the Cruiser’s forte was never how it drove but how it looked, a mix of old school gangster sedan and modern aerodynamics. It was a hit with the boomer generation who took to the little car like a fish to a frying pan. This custom job takes the factory retro styling and turns it back to eleven. For some reason Cruiser owners can never leave well enough alone and festoon their cars with all kinds of additional personalizations. That has resulted in everything from woodgrain paneling to moon discs and custom grilles having been visited upon the Cruiser over the years. According to the ad this one was the result of hundreds of hours of bodywork and custom fabrication. Gone are the aerodynamic composite headlamps, having been replaced by a set of bullets off of what is said to be a ’41 Chevy. There’s also 1950 Plymouth tail lamps, side skirts, a windshield visor, and a split on the hatch glass that serve to heighten the retro vibe. Inside this now Plymouth-branded Cruiser there’s an upgraded stereo and nav unit for your feet, as well as some cool burlwood and pin striping giving the dash a Von-Dutch treat. The back windows have been covered over and the door handles shaved for a panel van look (actually the PT Cruiser was categorized as a truck by the NHTSA, so that’s kind of fitting) which provides a canvas for any advertising you might want to put on the car. But, would anyone want such a unique rolling billboard? And more to the point, would anyone pay $9,999 for the opportunity to do so? What do you think, is this unique retro-splashed retro mobile worth that kind of present day cash? Or, is this a rolling billboard unworthy of reaching for your billfold? Long Island Iced Tea, or go here if the ad disappears. H/T to Ori Filhart for the hookup!